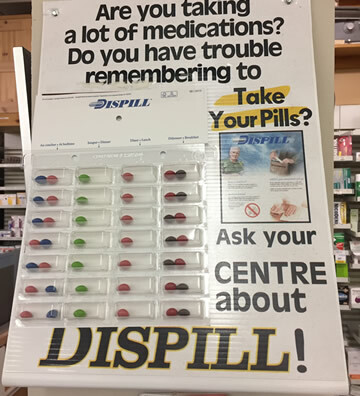 Family Drug Centre pharmacists give consultation on all prescriptions taking the mystery out of why you are taking certain pills. Also offer a basic med review(insured by MSI). Prescription refills online using our downloadable app on your smartphone/pad/or computer. Your time is valuable order online to streamline your Family Drug Centre experience. Drop by pharmacy for details. Have all you and your familys prescriptions transferred to Family Drug Centre to have all prescription needs filled in one place. Our pharmacists will take care of all the details. No need for you to contact your existing pharmacy. That's all part of the service. Our pharmacy staff will gladly take care of every detail. In Nova Scotia the influenza vaccine is free. We offer custom blister packaging to suit your needs. Taking multiple medications and having trouble remembering dosing times? Dosing times are critically important. Missing doses is serious. Helps us solve your problems with blister compliance packaging. Never be confused again. Drop by pharmacy. Our staff will gladly explain. Senior Citizens Day is the second Thursday of every Month. Receive a 20% discount, (some restrictions apply). We gladly offer this service in respect for all that our senior population has done for this country. Without them there would be no future.